Degrees of sheen - What gloss level should I select? The Resene product range and Resene Total Colour System provides a huge variety of colours available in different gloss levels to suit all applications. Gloss paints have a highly reflective smooth surface and are easier to clean than paints with less surface smoothness. They are ideal for areas exposed to heavy traffic or heavy use, especially where fingerprints, grease or grime are common. Colours tinted into high gloss paints appear cleaner and more intense than colours tinted into flat paints. Due to their highly reflective appearance, gloss paints tend to highlight surface imperfections. If the surface to be painted is marred or irregular it is best to select a paint with less sheen. Gloss greater than 80% gloss: Resene Hi-Glo, Resene Enamacryl, Resene Super Gloss. Semi-gloss paints have a slightly glossy appearance that is not as highly reflective as that of gloss paints. These types of finishes offer good stain resistance and are easy to clean. Paints with a semi-gloss appearance are excellent for use on many of the same areas as gloss paints. They are ideal for walls and woodwork that is subject to wear and on weatherboards and exterior cementitious surfaces. Semi-gloss 30-45%: Resene Sonyx 101, Resene Lustacryl, Resene Lusta-Glo. Satin paints tend to impart more warmth and depth to surfaces than do flat paints. They are more stain resistant than flat paints, but less stain resistant than semi-gloss and gloss paints. Satin is also becoming a popular option for roofing. 20-30% gloss: Resene Summit Roof. Low sheen paints are the most popular finish for interior broadwall areas and an ideal choice where some sheen is desired and good cleaning properties are necessary, such as in living areas, hallways, bedrooms and playrooms. Occasionally, these types of paints are used for ceilings; however, their slight sheen will tend to highlight surface imperfections. Outside low sheen finishes are most commonly used over timber, concrete and plaster finishes. Low sheen 3-19% gloss: Resene SpaceCote Low Sheen, Resene Zylone Sheen, Resene Lumbersider, Resene X-200. Flat paints diffuse light, so they tend to conceal surface imperfections better than paints with higher sheen levels making them a good choice for general use on walls and ceilings, especially those that are dented or rough. Colours appear muddied and darker in a flat finish than in a glossier finish. 'Flat' finishes have a micro rough texture that may trap dirt and make cleaning more difficult than higher sheen paints. It is wise to use flat paints only in areas that do not tend to get soiled. Flat/matt less than 2%: Resene SpaceCote Flat, Resene Ceiling Paint. The current trend in finishes sees semi-gloss and low sheen finishes replacing higher gloss finishes on exterior weatherboard, stucco and other uneven surfaces. On the interior, low sheen finishes are extending from broadwall living areas into well ventilated bathrooms and kitchens. A mix of gloss levels within one area is becoming a popular way to create a subtle visual effect or highlight feature areas. Where possible, avoid using semi-gloss or gloss paints on walls and ceilings as they will highlight surface imperfections. In comparison, matt or flat paints reflect light back in a diffused form minimising the appearance of surface imperfections. You do not need to use the same gloss level on ceilings and walls. In living areas it is very common for the walls to be painted in a low sheen finish like Resene SpaceCote Low Sheen or Resene Zylone Sheen and the ceiling to be painted in a flat finish like Resene Ceiling Paint or Resene SpaceCote Flat. Gloss levels of paint will impact on how colour appears in certain light. The higher the gloss level, the higher the reflectance - that is, more light will bounce off a wall painted with a high gloss finish than a flat finish. Some people prefer trim areas such as doors and windowsills to be painted in a higher level of gloss than the surrounding walls. Higher gloss paints tend to be used in rooms such as bathrooms, kitchens and laundries as they generally complement the reflective surfaces and floors found in these rooms. Low gloss, flat and satin finishes are popular for living areas and bedrooms where the lower sheen finish complements the soft furnishings and dècor. Kitchens, bathrooms and laundries are known as 'wet' areas and need special protection from steam and moisture. In these areas an easily cleaned surface is desirable. Traditionally this has forced decorators to use gloss and semi-gloss paints; however products such as Resene SpaceCote Low Sheen waterbased enamel now allow decorators to use a low sheen product in these areas without sacrificing durability or cleanability. It is becoming increasingly common for decorators to use a low sheen finish throughout their home's interior. See the Resene Recommended paint systems for the right paint system for your project. The gloss of a paint is essentially an aesthetic attribute, but with secondary technical implications. The vast majority of paint binders are inherently somewhat glossy and uniform reduction of gloss requires the precise disturbance of the surface of the film, so as to diffuse the incident light on it. By this definition flat paints are always rougher than glossier paints, even though this roughness is on a very small scale. Nonetheless this roughness and the way in which it is achieved affects the cleanability of the surface, the durability of the surface and the mechanical strength of that surface. As a rule of thumb, within the same generic type of paint, glossier products will have more durability than their flatter counterparts. The rate of drop off in the durability of exterior waterborne paints with decreasing gloss is much less than that of solventborne paints and while very useful lives may be achieved with low gloss and flat waterborne paints outside, solventborne paints of the same degree of gloss would erode very rapidly. Gloss is not uniform over the range of viewing angles. Sheen paints may appear to be quite flat when viewed directly on (that is at 90û to the surface), but may have quite a high lustre when viewed along the surface. 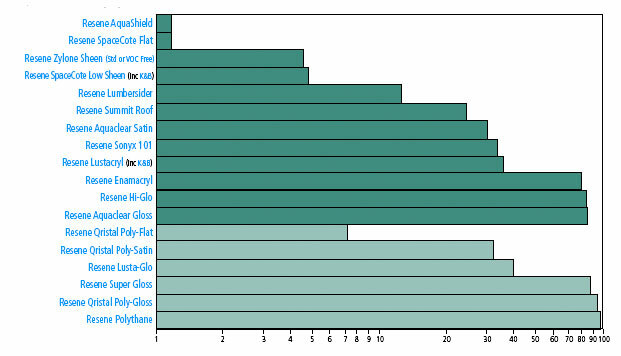 This may be quite significant when painting long rooms or corridors, particularly those which have a light source at one end.The chart below shows the relative levels of gloss between our decorative products as the eye sees them. In other words, Resene Sonyx 101 has a gloss level halfway between Resene Lumbersider and Resene Hi-Glo, while Resene Zylone Sheen is halfway between Resene SpaceCote Flat and Resene Lumbersider.